HR function requires people who are knowledgeable about HR Practices, patient, having right temperament to handle delicate situations. Very often, there are HR situations in the industry which are already charged up. We need someone to apply a soothing balm for charged up situations. Sharma is one such cool and calm HR Professional. Even a super excited Union leader will become calm when he meets Sharma! Sharma has his own way to communicate even difficult things in a calm manner. He tries to understand the issues of the other person clearly before pushing his point. Sharma is not only good with people, he is also very systematic person. He learnt some good systems in Rane group during his 14 year stint. He has taken that experience very well to his next companies and excelled in his work. 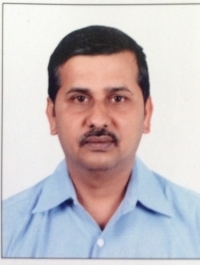 Sharma is now HR head in Texport Garments, Hindupur. He is handling about 2000 + employees and related HR activities. He is doing some great work there. We are sure Sharma will add value and a soothing balm to all the companies and situations that he gets involved in!! Keep doing well Sharmaji!! Learning and Development (L&D) function flourishes in some companies due to the person heading it. The L&D function requires a lot of passion on the part of the person heading it. He needs to enjoy helping people. He should be a person who enjoys seeing people improve and flourish. In a busy manufacturing company there will be many obstacles in the path of developing people. He should have the persistence to go after the goal, convince all the stake holders and ensure the Learning & Development flourishes. Rajinikanth is one such L&D head!! He works with a rare passion wherever he goes. He wants to ensure the people around him are improving continuously. He designs the Training programs very carefully and innovatively. 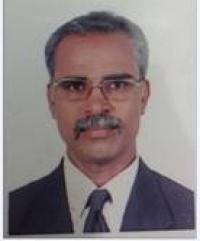 He is currently L&D head in Mangalore Chemicals and Fertilizers (MCF). Congratulations to Rajinikanth for showcasing MCF in global HR practices! Among four other Indian companies, MCF is recognized by ‘The Association for Talent Development’- USA for their Management Trainee Development Program in the category of ‘Excellence in Practice’. We are sure Rajini will achieve many more laurels on his way to training and developing many more people in all the companies that he works! Keep doing well Rajini !! The Labour productivity in the Indian Manufacturing companies is abysmally low. The principles of lean are very simple and with the help of these principles, the labour productivity can be improved manifold. But, very often it is not just the lean principles that are needed. The human element in the change program is very important. Even though the improvements are simple, it is not easy to push them forward due to the resistance from human element. Venkatram has learnt this art at an young age! 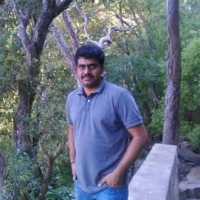 He joined as GET in Sandfits foundry pvt ltd, Coimbatore and got involved in implementing Lean Projects. Foundry is a tough environment. It is not easy to do any improvement in a foundry. But, Venkat has successfully implemented Lean projects and handled the human element very well. He interacts with all concerned whether junior or senior in an easy manner. He goes about his job in a ‘no-nonsense’ way. Improving the productivity in a project and going on to the next project looks like a normal way of life for this youngster! Sandfits and the Indian manufacturing is lucky to have Engineers like Venkat! Keep aiming higher Venkat! Co-ordinating the implementation of a new Business System in a company is a very difficult job. It involves unlearning for a person and learning new things so that he/she can help the organization in the implementation of the new system. A.K.Padma is the Co-ordinator for Work Management Systems in Sandfits foundry pvt ltd, Coimbatore. She has taken up this responsibility initially in addition to her other responsibilities. She struggled with both responsibilities for some time. But, she has put her heart in to the work and learnt the WMS concepts in the training programs. She started getting a grip on the concepts and also started interacting more and more with the team in the company for pushing the implementation with more vigour. She successfully implemented the system to the second level involving many Engineers / Executives. It is never easy to co-ordinate with a large number of people and ensure the system is implemented in a thorough manner. Padma has grown in the job and now reasonably comfortable with the responsibilities. She is learning continuously and trying to do her job even better. She is a good example of continuous learning! Keep it up Padma!! In Manufacturing companies which are having improvement agenda will often attempt to put a full time co-ordinator and this co-ordinator has to bring energy to the whole process of improvement. Everyone cannot achieve this objective of inducing more energy in to the system. 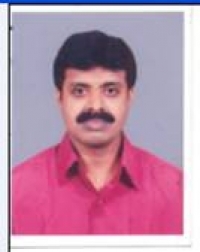 Sreenivasan is Co-ordinator for WMS (Work Management System) in Propel Industries Pvt ltd, Coimbatore. He has brought a lot of energy to the job. He interacts with all the functions in a very energetic manner and contributes to the progress of the WMS in Propel. Even though he worked in line responsibilities earlier, Sreenivasan is able to motivate everyone senior / junior to adapt the system to their benefit. Sreenivasan is also giving priority to the motivational aspects of promoting a system. He helps the organization in identifying and rewarding the good performers in the company. Engineers like Sreenivasan are assets to the Indian Manufacturing Industry! Keep it up Sreenivasan!! The Indian manufacturing is full of professionals who are very passionate about the job that they do and they very often become tough while pushing various day to day issues in companies. They are often seen as tough disciplinarians in the company concerned. Kumar is one such professional. 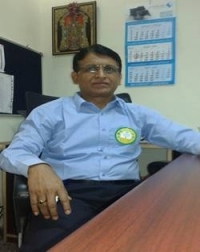 He had been managing Quality in Flow link Systems Pvt ltd, Coimbatore in an excellent manner and he was a natural choice to head the Work Management Systems implementation responsibility when the company took up this project. Kumar modified his behaviour to suit the job. He started co-ordinating the responsibility in an exemplary manner. There may be still people who say he is a tough guy! But, the speed with which he implemented the Work Management system in the company is wonderful. 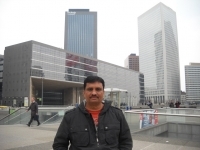 The quality of Work Management system in FLS is of high order, thanks to Kumar! Kumar is also passionate about training. He defined a good system of measuring the skills and training for Inspectors which is a sensitive area in FLS. Now, Kumar is busy defining a system of skills and training for the whole Manufacturing! We are sure he will do a great job! We are sure Kumar will create a great system in FLS!! Keep going Kumar!! Every growing Executive would dream of bigger responsibilities. Some of them may get these higher responsibilities. Not every one of them can make it a success. Pradeep is not one those unsuccessful ones! He started handling a specific responsibility in Propel Industries, Coimbatore and he delivered some fantastic results for the past two years! He is an enthusiastic youngster who brought a lot of vigour and energy to his job. He aimed high and took help from the environment as needed. He engaged with the customers consistently and improved the service to the customers along with improving the turnover of the Company. It has become a wonderful win-win for the Company and the customers. Pradeep is continuously aiming at higher and higher targets in the company in terms turnover and also in terms of Customer service. We are sure he will achieve all the targets with his enthusiasm and passion towards work! Keep aiming higher Pradeep!! Professionals keep moving from company to company in their careers and all of them try to bring their long experience to work in the new company to resolve the issues in that company and improve the processes. Not everyone would succeed. The reasons can be many! Kotresh is one of those successful professionals who make a difference in the companies they work for! Kotresh is a senior professional with a lot of experience in Foundry technology! He joined Flowlink Systems, Coimbatore and made a big difference to the Company in a short time. He is having a lot of agenda to complete in the company. But, he has made a great start and quickly implemented a lot of technological improvements. Managers who have put in a lot of years of experience generally have reservations to accept a new system. Kotresh is an exception! He adapted the Work Management System introduced by the company and improved his focus on the business issues. He adapted the practices to new areas very actively and got good results from those practices. Kotresh is having a big agenda for improvement in the company and is actively engaged on them. Professionals like Kotresh are assets to the company that they work for and for the Indian Manufacturing Industry!! Keep going Kotresh! Many Manufacturing Companies recruit fresh Engineers. Many of these Engineers bring fresh energy in to the companies. They bring in no baggage and perform with matchless vigour! Sriram B. is one such Engineer! 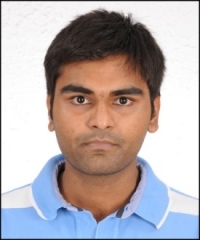 He joined Eltex Super Castings as a Graduate Engineer Trainee and contributed a lot to the Company in a short time. He participated in the ‘Work Management System’ launched by the company, contributed to spreading the good practices in the company. He worked with many Managers who are all elder to him and convinced them to practice the Work Management system principles. He is mentored and supported by the HR Manager, Selvaraju and the unit head Mr.Victor. Sriram has gentle ways with assured results! He learnt the concepts of Work Management system very well and worked silently to promote it. He also started participating in Lean implementation in Eltex. He already started highlighting the improvement areas very well and we are sure he will contribute well to the Company! Engineers like Sriram are the beacon of hope to the Indian Manufacturing to improve the productivities and efficiencies to the world class levels!! Keep it up Sriram !! Working hard at an young age is difficult! Especially when you are just out of college and your father is a business man with Rs 2000 crore empire!! But, it is not so for Mitesh Lohiya! Mitesh got in to his father’s company after completing B.Tech in Chemical Technology. He joined the manufacturing function and handled the Plants. He achieved some very good improvements very quickly in the Plant. Then, he went on to the Sales function in Lohiya industries limited the owners of Gold Drop brand Sunflower oil. Gold drop is the market leader in Telangana and Andhra Pradesh. Mitesh produced some astounding results in Sales in a very limited period! He more than doubled the sales in the region where he got involved!! He depended on very basics during this period of connecting with the Customer directly and ensuring he gets a quick solution /service!! The Sales team struggled to keep pace with him! He motivated them with some incentives and more than the money he showed them that they are capable of producing much better results for the company. He is making everyone think once again about ‘what is possible’ in the company!! Now, he is thinking big and wants to achieve some very big targets!! Mitesh is a perfect example of youth blended with a strong business sense coming from his family and a ‘no-nonsense’ approach!! Mitesh will achieve much higher results in his company!! He will create a mark of his own on Lohiya industries! Go Mitesh !Go !! In Manufacturing environment an Engineer has to learn quickly and continuously in his career. When you are put in to a company, you may get thrown in to intense activity and any amount of training will not help in some circumstances. The Engineer has to work hard, with his nose to ground and learn. For this, he has to maintain good relationships with his bosses, his team of workmen who may be very often have more experience than the Engineer himself. The day to day issues on the shop also make it essential for the Engineers to be pleasant and friendly to maintain a good camaraderie in the shop floor. Bazar Chiranjeevi is one such Engineer! Chiranjeevi is very thirsty for learning. He maintained wonderful relationships with the workmen throughout his career. 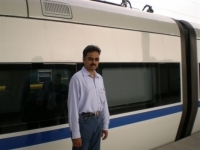 He started his career in a TQM environment in Rane Brake lining limited, Hyderabad. He quickly learned the ropes and started impressing his bosses. He did not take much time to create his own style of working and managing the work! He became a reliable Supervisor to his bosses. Chiranjeevi went on to work in more companies. Everywhere he created his own style of functioning and improved the shop floor. Chiranjeevi is good in promoting Quality circles. He helped many teams in his career to excel !Chiranjeevi implemented Lean Manufacturing principles in many companies that he worked for! He is a very good Lean practitioner! Chiranjeevi is Plant Manager in a MNC company today! He continues to excel wherever he works! Chiranjeevi had been a wonderful Engineer wherever he worked! He is a true Manufacturing star! Keep doing well Chiranjeevi!! China is considered to be the ultimate destination for manufacturing. No doubt India is catching up. But, it is beyond doubt that China is THE manufacturing hub for the world as of now!! China as a market also is a complex one. Every manufacturing Engineer tries to understand the manufacturing secrets of China! It is a dream for every Manufacturing Engineer to work in China and get that experience! Vijaykumar M is one such lucky Engineers!! He spent 5 years in China working for Elgi equipments limited. He achieved a lot in terms of establishing a Quality system in a faraway land! He worked well with the suppliers, Chinese employees and adjusted with the cultural differences very well. Vijay dealt with Chinese customers, Chinese government officials , Chinese suppliers with equal comfort. He learned Mandarin formally in China. He had to put up with severe weather and number of issues on his family front during this period of 5 years. But, as only Manufacturing Engineers can do, he worked hard and selflessly to ensure that the company’s objectives of setting up a manufacturing unit are met! Vijay was a true ambassador for Indian Manufacturing in China! He is a real Star of Indian Manufacturing!! Well done Vijay! You can be proud of your achievements !! In Manufacturing, the implementation of systems is a critical experience for an Engineer. He /she needs to learn the system in the first place. Many times Engineers get this chance early in their career. When they get the chance they need to learn the principles / concepts in a clear manner. Only then they can hope to implement those systems elsewhere. Not every Engineer learns these concepts well. Anbukumar Subramanian is definitely one of those who learned the concepts of Lean and Quality principles in companies like Rane TRW, Nokia etc. After this when he joined his next company, he was well equipped with good concepts. Anbu managed the cultural differences very well to implement the Lean principles in Elgi Equipment limited’s China factory. He worked with the local team under the able guidance of his boss and implemented Lean / TQM principles in China factory of Elgi. Anbu got a unique chance to implement several projects and he made good of every one of them. Anbu can deal very well with the people element. He develops good relationships and ensures the people are bought in to the system that he is trying to implement. This is a very critical quality for a Systems implementer. Anbu is definitely one of the progressive Engineers who learnt Lean / Quality concepts and is capable of reproducing them in companies that he works for. Anbukumar Subramanian is a true manufacturing star! Keep it up Anbu!! Implementing new best practices on the shop floor always involves the human element. The shop managers will have to show a lot of understanding of the human element, address the concerns of the shop employees, if required demonstrate them that the new way of working is actually possible by doing the work themselves! Those Managers who are able to do the work with their own hands and demonstrate the new ways can command respect of the shop employees! This is needed as the Managers will have to understand the working conditions themselves! While this sounds simple, some of the Managers in Indian Manufacturing fail at this test! Vijay kumar is one of those Managers who does the work with his hands if need be to demonstrate a new concept. This quality helped him to implement Lean practices on the shop and improve the productivity manifold! He is a hard working person who has high standards for himself and his work on the shop! Vijay is well versed in Lean principles and he improved the shop productivity in most of the places that he worked! Vijay gets along with the Shop floor employees very well and he leads his team in a very democratic manner! While there are some shop floors which have seen big productivity improvements, there are many more which have not seen this. Managers like Vijay are very much needed in the Indian Manufacturing to improve the Productivity manifold! Vijay, you are a real star of Indian Manufacturing! Keep it up! Keep spreading the productivity principles!! Migrant labour had been a common phenomenon in India and elsewhere. Many of the South Indian Manufacturing companies had been benefitting from the workmen from North. These people are hard working. They work in difficult circumstances, away from home and need to deal with different languages. They do it wonderfully well ! South Indian Manufacturing companies cannot do without them!! One such team is the above one working with Sandfits foundries, Coimbatore. This team not only works hard, but works out good improvements in their working methods. When the Management team suggested the improved way of working, they were more than willing. They experimented with the way of working and improved it. They were happy to see that their work eased out and also the productivity has improved!! Mithilesh and team have contributed to the progress of the company that they are working for and they are the true stars of Indian Manufacturing !! Keep up the good work team !! Improving efficiency of people with the help of implementing systems is a priority in all the organizations in Indian Manufacturing. But, only a few companies are successful in making this happen. This is due to the fact that it is not easy to implement and sustain organizational initiatives (Like TQM, TPM, 6Sigma) It requires a firm commitment from the Management. Next to this , the most important thing is the quality of Co-ordinator for this activity. Every company needs a full time co-ordinator for pushing the organizational initiatives. This is a very crucial position. The co-ordinator has to formulate a clear plan for implementation of the Organizational initiative. He has to deal with a wide variety of people from across the organization and across various levels of the organization. He has to be very patient and at the same time focused on the objective. ThilipIndiran is one of such excellent Co-ordinators ! 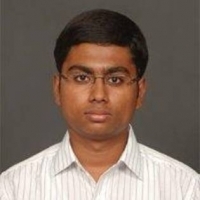 Thilip is a B.Tech and an MBA. He is currently ‘Head – Manufacturing Excellence’ in Johnson Matthey. He worked in Danaher, Elgi in similar positions. 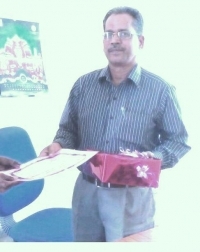 Thilip contributed a lot to the progress of the Organizational initiatives in all the companies that he worked for. He is patient with people and helps them to absorb the change and get used to the new situation that is brought about by the Organizational initiative. His persistent efforts have yielded very good results. By contributing to these organizational initiatives Thilip has contributed to the progress of many of the companies that he worked for. The fact that he had been working in the Organizational excellence area in his past 3 jobs is a testimonial for his expertise in this area. People like Thilip are very critical to the Indian Manufacturing to make it to that next level! Thilip is a true star of the Indian Manufacturing !! Keep going Thilip !! Manufacturing Companies need to continuously save money on their operations. The biggest cost in any manufacturing is the cost of Input raw materials. Cost reduction on Input Raw materials becomes a very important subject for any Manufacturing company. With development of Internet, the globe has shrunk for the Sourcing manager in Manufacturing companies. He/She can access any supplier anywhere across the globe. But, still only the best of the Sourcing Managers can identify and access the cheapest sources in the world ! This requires a deep commitment on the part of the Sourcing Manager to chase down the suppliers across the globe, negotiate hard with them and deliver sizeable cost reductions for their companies! 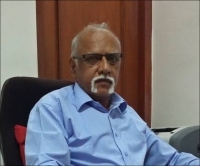 Sivakumar Krishnamurthy is one such Sourcing Managers. Siva has done a great work for Elgi Equipments limited till a few years back when he left that company for better opportunities. Siva identified some of the cheapest sources across the world and developed excellent relationships with them. He has wonderful knowledge about the sources for many industrial parts. He dealt with different international cultures with his down to earth approach!! He is always on the lookout for that cheaper source! He never compromised on Quality while looking for cost reduction! 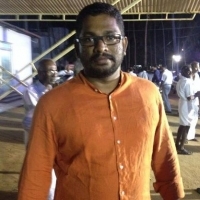 Siva saved Crores of rupees for the companies that he worked for. He adopted the “Total Cost of Ownership” approach to look for cost reduction opportunities. Siva is very persistent in his approach and chases down everyone concerned to complete the Cost reduction projects on time. Sourcing managers like Siva are great assets to any manufacturing company! Siva is a valuable star of Indian manufacturing!! Keep on saving Siva!! Foundry is a difficult place to work in. The physical environment is punishing. It is very difficult to motivate the team to perform better every day! One needs to deal with many variables. It takes a very good leader to motivate the team and maintain good standards in a foundry. D.T .Victor Paul Vethanayagam is one such leader. He is a B.S from BITS Pilani and M.S in Management from the same institute. Victor is heading the team in Eltex Supercastings Private limited, Coimbatore. Victor is a great motivator of people. He understands the Foundry situation very clearly. He challenges the team members and at the same time supports them to go to the next level. His understanding of the foundry practices and his leadership abilities help him to deliver in a foundry situation. Victor is passionate about learning. Even though he has put in 26 years in to the industry, his passion for learning has not waned. Infact it is increasing by the day. His learning ability is helping him make steady progress in his career. Victor is a ‘hands on person’. He gets in to all major shop issues and helps his team solve them! Victor is helping his company to serve some of the biggest automotive customers in India. He is contributing directly to the success of a number of Indian Manufacturing companies. He is a real star of the Indian Manufacturing industry! Keep it up Victor !! Today is the day of Coimbatore Marathon. Thousands of people participated in this marathon in support of Coimbatore Cancer foundation. There were young, old and very old. All running for a good cause! The Marathon was organized in a wonderful manner. Everything went like a clock work!! The man behind this idea and this marathon is Ramesh Ponnusamy. 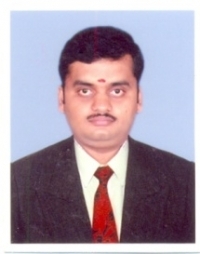 He is currently Managing Director of ATS Elgi Limited, Coimbatore. 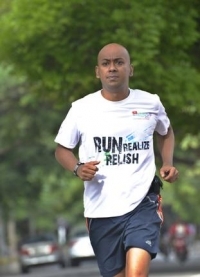 Ramesh is a passionate runner having participated in many marathons across the world!! There are very few people who can inspire thousands in to action ! Ramesh Ponnusamy is definitely one of them. Ramesh started the marathon in Coimbatore in 2013. Many corporates have come forward to support this cause. Ramesh is a dynamic leader at work and great motivator in his running club! He is definitely a shining star in the Indian manufacturing arena !! Keep motivating thousands Ramesh !! Most of the Managers in the Indian Manufacturing are good at working in a good system. They exploit the strengths of the system and produce results. The companies would need these Managers to create new systems in a few new areas. These areas may be the new plants that they have started or may be companies that they have taken over etc. Most of these Managers fail to do this. They cannot create new systems or even re-create the systems that they are following. Very few Managers are capable of creating something on their own. 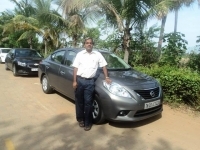 SubashRamdoss is one of this rare brand of Managers who can create systems and improve the performance of the Company. When Subashwas thrown in to a messy situation , he responded by creating a wonderful Manufacturing system and improving the Customer confidence manifold. He leads the team firmly and fairly. He is a great motivator of his team members. Subash’s way of working always generates kaizens in the area that he works in. Subash is a true Star of Indian Manufacturing !! We are sure he has many more peaks to scale !! All the best Subash !! Seldom we come across natural leaders! Indian Manufacturing has its’ share of these natural leaders. These leaders can inspire confidence and trust without much effort. Because, they are fair and firm. They ensure that the team is motivated and they are taken care. They often do not hesitate to demand the team members to go to the next level of performance!! While they push them, they also support them to make it!! Gootypalle Ranganath is one such natural leader! He did some fabulous work in Rane group in Rane Brake lining limited. 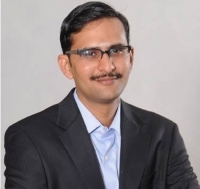 Ranga was part of the team in Rane Brake lining limited which won the Deming Prize in 2003.Now, he is General Manager (Operations) handling two of the Plants of Rane Engine Valves Limited in Hyderabad. Ranga as he is known to his friends is a firm believer in TQM, TPM. He uses them with passion and teaches to his team with the same passion. Ranga has contributed a lot to the Indian Manufacturing and continues to do so! Keep it up Ranga ! You are a real star of Indian Manufacturing !! Finance people usually may be reserved and may appear tough! They need to implement the financial discipline across the company. May be this is the reason. Most of the Accountants try their best to balance the tough portion with the friendly portion. But, probably there are more Accountants on the ‘tough and reserved’ side than on the ‘friendly side’!! Deepak Govindan is one of the few on the side of the ‘friendly accountant’. He is very tough with the rules as needed. But, still looks at the overall business picture and offers his help from the finance and business angles. He works very closely with the Marketing people and ensures that the decisions that need to be taken at the right time do not get delayed due to any issues in finance. He is proactive and takes an overall business view rather than just a functional view of everything ! Deepak gets impatient when the business is not progressing. He sometimes gets in to the role of pushing the team for higher sales or production!! He does not hesitate to come out of his traditional finance role and enter the business arena!! This way Deepak is one of the modern accountants who play an active role in achieving higher business goals!! Business Leaders are born out of this attitude of going beyond the brief!! Deepak, carry on the good work! You are a star in Indian Manufacturing!! Many companies may have big plans for implementing several initiatives. But, it is always the Shop floor employee who has to play a big role in making them work on the shop floor. Bull agro implements, Coimbatore implemented Lean practices in their shop floor. Raw material Super market is one of the most important part of the Lean practices of Bull agro. Lean practices are new to Bull agro and the concepts are new to the company. Ramesh who is highlighted in the picture has played a big role in the success of the Super market in the shop floor. Ramesh is the proud owner of this Super market! He learnt the principles carefully from his super visor and follows them to the core!! From the day the Super market was started, he owned it up totally and made it work on the Shop floor. With the help of this super market the shortages in the shop floor have reduced dramatically. Ramesh has a very big role in its’ success!! 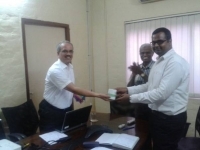 Here, Ramesh is being recognised by their MD Mr.Chandramohan. Keep it up Ramesh !! Usually the people who work in Manufacturing industry get very emotionally involved in their work and put their best in to the work! They feel happy when good results come and feel very bad when they can’t deliver what they want to. It is almost like the factory is their whole life !Damodar Rao seen in the picture is no different! He delivered the best wherever he worked. He emotionally got involved. He is a great supporter of his team members. He pushes himself very hard to deliver the best. 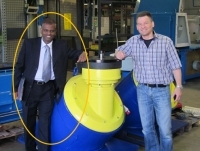 Damodar was part of the team which won the Deming Prize in Rane Brake Linings Limited in 2003. Damodarrao went on to implement what he learnt in a few more companies since then. He was appreciated wherever he worked!! Damodarrao is a true practitioner of TQM!! 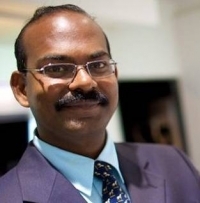 Damodar is a true Star of Indian Manufacturing with his contributions to the various companies that he worked for !Damodar is currently the Plant head in Johnson Controls, Chennai. Keep doing well Damodar !! Every company which has multiple units across the world knows the troubles about transferring manufacturing technology across its’ plants. It is a continuous struggle to ensure the best practices are transferred across the plants, the teams in the overseas plants are trained properly and so on. 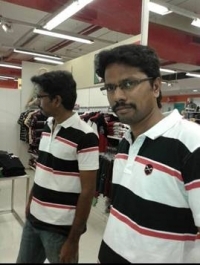 Panneerselvam started as a workman in Elgi Equipments limited and grown to being an ‘After Sales Engineer’. He is highly skilled at his work. His dedication to promoting higher standards in manufacturing is wonderful! He improved the manufacturing lines, transferred best practices and trained manufacturing teams with a great passion! He worked in different cultural environments, in sub-zero temperature, learnt the local languages in different parts of the world and delivered for the company!! He is liked by all the foreign teams for his knowledge of manufacturing and his skills. He is much more than a workman. He practiced cultural sensitivity, he became a wonderful trainer without any of the training that we talk about in Cultural sensitivity and training the trainer and so on. Elgi’s work environment allowed several people like Panneer to flower!! Keep doing well Panneer!! You are a star of Indian Manufacturing!! Normally, in any Manufacturing company the Staff and the Managers will be running after the workmen and junior staff for doing improvements. It almost considered a normal accepted fact that senior people run after junior people for improvements in a manufacturing set up! But, this is not true in case of Irudaya Raj who was a workman with Elgi Equipments limited, Coimbatore and grown from there to the next level with more responsibilities. He is one of the most passionate Kaizen practitioners that I have come across in my life. He has unending energy to pursue the improvements. He chases the staff / Managers / Directors for support on the improvements. He goes beyond his normal call of duty to ensure that the improvements are done on a continuous basis. He keeps his vigil on the wastage in the company and continuously launches initiatives to recover money from what is scrapped!! He has the company’s interests at his heart and is relentless in his follow ups! I have not seen this enthusiasm / passion in many people in my career! Elgi is lucky to have such employees in its’ fold!! Keep going Irudayaraj!! You are a star of Indian Manufacturing! !